Lock in a great price for The Riverside Inn – rated 9.2 by recent guests! We felt spoilt and did not want to leave. The staff was very friendly and helpful. The room was gorgeous and very peaceful. The common rooms were inviting. The presence and attention of the Manager to all details was rewarding and excellent. The place is easily accessible and well located from the town and main attractions. The vicinity of the restaurant The Rock is very convenient although quality at the restaurant has deteriorated since our last visit a year ago. Excellent service, staff very helpful and it a charming little town. The food at the Rock Restaurant next door is a joy to go to each day for breakfast, lunch or dinner. There are other excellent restaurant's in the town for all your dining needs. All around a great placed nestled in the value of a volcano! I would go back to this Inn in an instant! Service and Staff are extremely friendly at the Inn and Restaurant. The food was outstanding for breakfast, lunch and dinner. 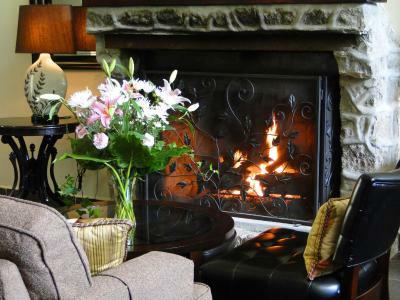 The Inn and Restaurant are both peaceful and elegant and reasonably priced. They are extremely clean and the landscaping is quite beautiful. Really nice and helpful staff. Great surroundings. Spacious & comfortable accomodation. We had to change rooms but received a complimentary bottle of wine because of this. Perfect walking distance location, close to The Rock restaurant and friendly personnel. Excellent placement in the nature. Delicious breakfast. Ordered room service from the restaurant in a building next over on the property and it arrived quickly, hot and fresh. GREAT breakfast yogurt, BTW. Staff overall are efficient and polite. Location is peaceful, right next to the Caldera river. There was a fire in the fireplace, great to read or snuggle by, and the honor bar would be very cool to share with friends (we went as a couple). You can play your own tunes or throw up a game on the flat-screen, especially if you have the place to yourself. Slept like a baby two nights in a row. Like! The Riverside Inn This rating is a reflection of how the property compares to the industry standard when it comes to price, facilities and services available. It's based on a self-evaluation by the property. Use this rating to help choose your stay! Located on the banks of the Palo Alto River, this hotel offers stylish accommodations with free Wi-Fi in a rural setting. The town of Boquete is just 3 minutes’ drive away. All rooms at The Riverside Inn feature an elegant décor with original works of art. Each offers views of the garden, river or valley. The private bathroom includes a bathrobe, toiletries and a hairdryer. The Rock Restaurant offers a selection of artisan beers and international wines to accompany their dishes. Staff are happy to provide information on activities in the surrounding area, including hiking, cycling, climbing, river rafting, or a tour of the Kotowa Coffee Estate. The Volcán Naru National Park is about 10 minutes’ drive away. The city of David’s Enrique Malik International Airport is 31 mi away. This property also has one of the top-rated locations in Boquete! Guests are happier about it compared to other properties in the area. When would you like to stay at The Riverside Inn? The elegantly appointed Luxury Double Queen Suite fits two queen beds comfortably and provides ample space to relax and enjoy the country home touches of the room, such as large windows, handcrafted wooden furnishings imported from Bali and a very special over-sized handicap friendly luxury bathroom. Arco Iris is perfect to accommodate groups of friends or families offering a wonderfully comfortable, spacious accommodations. This room includes 2 Queen Beds, handicap friendly bathroom, air conditioning system, wireless Internet, satellite Television, in-room sound system, in-room DVD Player, hair dryer, safety box, waffle-weave bathrobes and luxury bathroom amenities. 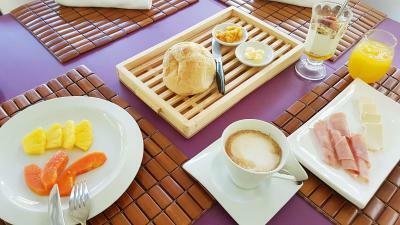 Other services offered are room service, laundry services, Parking and a Continental breakfast is included. Incorporating a stylish décor and casual elegance, the loft suites feature an oversize King size bed, handcrafted furnishings, elaborate wrought iron details, an large bathroom with a bathtub and two tween beds comfortably appointed on the top floor, making our loft suite a great space for rest and relaxation. This room includes 1 over-sized King-sized bed and Two twin beds in the loft area, air conditioning system, wireless Internet, satellite Television, in-room sound system, in-room DVD Player, hair dryer, safety box, waffle-weave bathrobes and luxury bathroom amenities. Other services offered are room service, laundry services, Parking and a Continental breakfast is included. The Junior Suites are richly decorated in shades of light blue and white, offering a soothing and calming atmosphere perfect for relaxation. A cloud soft King-sized bed, handcrafted furnishings, a bathtub and panoramic windows offering beautiful views of the inn’s carefully manicured gardens, invite our guests to sink down and really enjoy their stay. This room includes 1 over-sized King-sized bed, hot tub, air conditioning system, wireless Internet, satellite Television, in-room sound system, in-room DVD Player, hair dryer, safety box, waffle-weave bathrobes and luxury bathroom amenities. Other services offered are room service, laundry services, Parking and a Continental breakfast is included. The spacious Master Suite Orquidea, named after the abundance of species of orchids in the region, offers a romantic, country-inn atmosphere through calming colors and original works of art and handcrafted furnishings. French doors open onto a private terrace surrounded by our gardens and the soothing sounds of the Palo Alto River. The spacious bathroom is filled with natural light and features an over-sized hot tub and a separate walk-in shower. Bath salts and candles offer romantic, intimate touches to the bathroom. This room includes a King-sized bed with 100% Eqyptian cotton linens and duvets, private terrace, hot tub and walk-in shower, air conditioning system, wireless Internet, satellite Television, in-room sound system, in-room DVD Player, hair dryer, safety box, waffle-weave bathrobes and luxury bathroom amenities. Other services offered are room service, laundry services, Parking and a Continental breakfast is included. House Rules The Riverside Inn takes special requests – add in the next step! The Riverside Inn accepts these cards and reserves the right to temporarily hold an amount prior to arrival. In general no negative remarks. The coffee is luke warm and I believe a hotel of this quality should look for a better coffee brewing system. I will say that I have run hotel's for many years and this coffee will meet the needs of most. I dislike being charged for coffee in all hotels but this coffee was very good. I have not a single complaint. The restaurant could use a little more consistency. Continental breakfast starring sliced processed cheese-like products is a pity in a land of readily-available artesanal cheeses. Also, it's a pity to have to use AC in a cool mountain setting like this, but the building itself is not really set up for open windows. I mean, you can open them, but since it's all on ground level, privacy and bugs are an issue. Bed very soft and wood creaked and squeaked everytime you moved. No outside seating area. Quiet and peaceful. Beautiful surroundings. Staff very professional and friendly. Stunning property with lots of little extra touches. Our room air conditioner had a faulty fuse and stopped a couple of times during the night. This is an older structure, so it needs to be upgraded. The restaurant next door, called the Rock, was very good and of gourmet quality. The food was very well presented, the staff friendly and somewhat adequate in English. They had a bluesy/jazz band the first night we were there which was very good. There is an outside covered patio where guests can walk out to the river and take pictures.